Home » Technical Libirary » Industry knowledge » The step of producing steel sheet piles is what? The step of producing steel sheet piles is what? Kind of sheet piles in U-shaped steel sheet piles most widely used, and secondly there is a linear combination of steel sheet piless and steel sheet piles. U-shaped steel sheet piles section modulus is 529 × 10-6m3-382 × 10-5m3 / m, more suitable for re-use, often used in temporary structures. in the neutral axis located in the shape of the locking engagement wall. Having two locking end portion of the linear shaped steel sheet piless, it snaps a very high strength properties mainly welded tubular, assembled two U-shaped steel sheet piless and steel sheet piles combinations of modular construction methods. As for the combination steel pile shell material, steel sheet piless by suitable assembly can get a larger section modulus. According to the design conditions, construction, can change the length of the component. 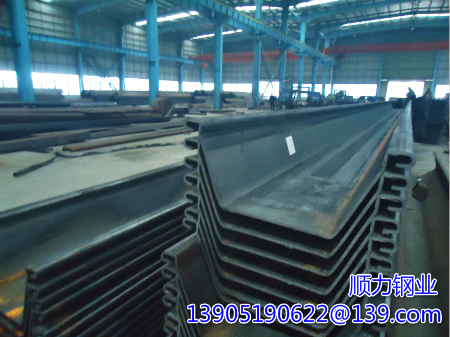 steel sheet piles is composed of large flat steel embryo or embryos before and after the furnace was heated to 1250 ℃ made of rolled, roll-shaped hole having a complicated shape several times through, little by little, step by step to form the final cross -sectional shape. Rolled steel sheet piles is completed at a high temperature state is cut according to the specified product length. After cooling the steel sheet piles by the calender roll straightening machine generated when the bending and warping rectified. Shunli steel industry was founded in 1996, it has 20 years of rich experience in production of steel sheet piles. Welcome friends and customers nationwide long-term win-win cooperation.